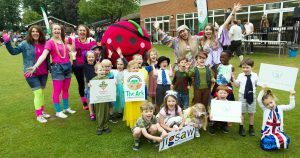 NEARLY 300 Ripley Court School pupils walked, ran and skipped around the grounds as part of the annual sponsored walk in aid of the school charities. The theme this year was 125 years of Ripley Court School, with the children dressing up in costumes from different decades during this period. The pupils, aged 3 to 13, were cheered on by their families, teachers and staff from Cherry Trees and Jigsaw Trust. Cherry Trees in East Clandon provides a home from home respite care for children and young people with disabilities and Jigsaw, based in Dunsfold, supports children and adults with autism.